The 1950 British Grand Prix, formally known as The Royal Automobile Club Grand Prix d'Europe Incorporating The British Grand Prix, was a Formula One motor race held on 13 May 1950 at the Silverstone Circuit in Silverstone, England. It was the first World Championship Formula One race, as well as the fifth British Grand Prix, and the third to be held at Silverstone after motor racing resumed after World War II. It was the first race of seven in the 1950 World Championship of Drivers. The 70-lap race was won by Giuseppe Farina for the Alfa Romeo team, after starting from pole position, with a race time of 2:13:23.6 and an average speed of 146.378 km/h. Luigi Fagioli finished second in another Alfa Romeo, and Reg Parnell third in a third Alfa Romeo. The race followed the non-championship Pau Grand Prix and San Remo Grand Prix (both won by Juan Manuel Fangio), the Richmond Trophy (won by Reg Parnell) and the Paris Grand Prix (won by Georges Grignard). 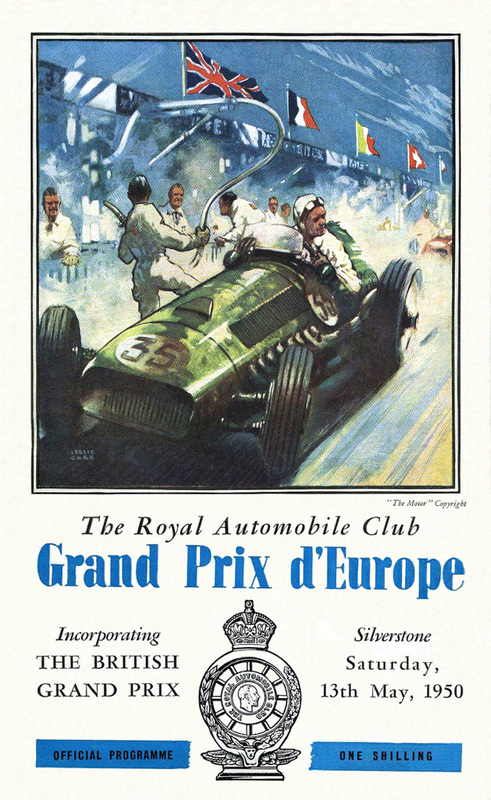 Held on 13 May at Silverstone Circuit, and also designated as the Grand Prix of Europe for 1950, this very first World Championship round was attended by George VI, Queen Elizabeth, Princess Margaret, and the Earl & Countess Mountbatten of Burma. In all, there were 22 competing, 21 qualified for the race, and 11 classified. Numbers 7 and 13 were not assigned. The Alfa Romeo factory team arrived at the circuit with four 158s for Fangio, Farina, Fagioli & domestic driver Reg Parnell. Ferrari decided not to take part but there were a handful of Maseratis, one of them a factory car for Monegasque driver Louis Chiron. Scuderia Ambrosiana prepared two cars for David Hampshire and David Murray, Enrico Platé entered two drivers of aristocratic origin, Prince Bira of Siam and Baron Toulo de Graffenried. Joe Fry entered a private Maserati and Scuderia Milano entered Felice Bonetto, but he did not arrive. These cars were raced in Italian Rosso Corsa livery. Talbot-Lago sent over two factory cars in the traditional French pale blue colour to be driven by Yves Giraud-Cabantous and Eugène Martin. Other private Talbots were entered by Louis Rosier, Philippe Etancelin and Belgian Johnny Claes, in a yellow car. The rest of the field was made up of local machinery, which included four E.R.A.s and two Altas, in British racing green. Farina was fastest in qualifying and the other three Alfas were alongside him on the front row. The second row consisted of "B. Bira" in a Maserati and the two factory Talbots. In accordance with the standard at the time, the rest of the grid consisted of rows of four and three alternating, up to the sixth row. Felice Bonetto was the only driver who did not take part in qualifying and would not take part in the race. On 13 May, 21 drivers from 9 countries were represented at the old Silverstone airport, 4 from France, 2 from Italy, 1 each from Belgium, Ireland, Monaco, Argentina, Thailand and Switzerland. The UK was represented by 9 drivers. The race drew 200,000 spectators. At the start of the race, Farina took the lead with Fagioli and Fangio in pursuit. In the early laps they switched around between themselves several times to keep everyone amused. Fangio retired with engine troubles and so Farina led Fagioli home by 2.5 seconds with Parnell a distant third despite hitting a hare during the race. The nearest challenger was Giraud-Cabantous two laps down, Bira having retired with a fuel problem. Crossley and Murray duelled at the back before retiring, de Graffenried had done so on lap 34, while Chiron was demoted to the role of viewer 10 laps earlier. Giuseppe Farina led for 63 laps (1–9, 16–37 and 39–70). Luigi Fagioli led for 6 laps (10–15). Juan Manuel Fangio led for 1 lap (38). Joe Fry drove car #10 for the first 45 laps, then Brian Shawe-Taylor took over for 19 laps for a total 64 laps, distance 297.536 km. Peter Walker drove car #9 for 2 laps, then Tony Rolt drove for and additional 3 laps, totaling 5 laps, a distance of 23.245 km. ^1 — Luigi Fagioli qualified and drove all 70 laps of the race in the #3 Alfa Romeo. Gianbattista Guidotti, named substitute driver for the car, was not used at the Grand Prix. ^2 — Peter Walker qualified and drove 2 laps of the race in the #9 ERA. Tony Rolt took over the car for 3 laps of the race. ^3 — Joe Fry qualified and drove 45 laps of the race in the #10 Maserati. Brian Shawe-Taylor took over the car for 19 laps of the race. ^4 — Entry cancelled prior to event. ^ Lang, Mike (1981). Grand Prix! Vol 1. Haynes Publishing Group. p. 14. ISBN 0-85429-276-4. ^ The Royal Automobile Club Grand Prix d'Europe. Royal Automobile Club. 1950. ^ "1950 British Grand Prix - Race Entries". manipef1.com. Archived from the original on 19 May 2012. Retrieved 6 January 2016. ^ "1950 British GP - Entry List". chicanef1.com. Retrieved 4 October 2013. ^ "Britain 1950 - Race entrants". statsf1.com. Retrieved 7 January 2014. ^ a b "British Grand Prix 1950 - Results". ESPN F1. Retrieved 7 January 2014. ^ "Britain 1950 - Result". statsf1.com. Retrieved 4 October 2013. ^ "Britain 1950 • STATS F1". www.statsf1.com. Retrieved 5 March 2019. ^ "1950 British Grand Prix". formula1.com. Archived from the original on 18 January 2015. Retrieved 25 December 2015. ^ "Britain 1950 - Championship • STATS F1". www.statsf1.com. Retrieved 1 March 2019.